Logical Deletion of a workflow instance (hence called “workflow”) means canceling the workflow. When logically deleted, the workitems are removed from the approvers’ work inbox. Please note, a logically deleted workflow cannot be reversed or restarted. However, all the information of the logically deleted workflow will remain in the workflow log/ NWBC Audit Log to start a new workflow instance with the same workflow request information. When logically deleted, the workflow does not get removed from the system, but only set to ‘Canceled’ or ‘Logically Deleted’ status. GRC workflow went into error status (cannot be restarted) and need to be removed from the approver’s inbox. 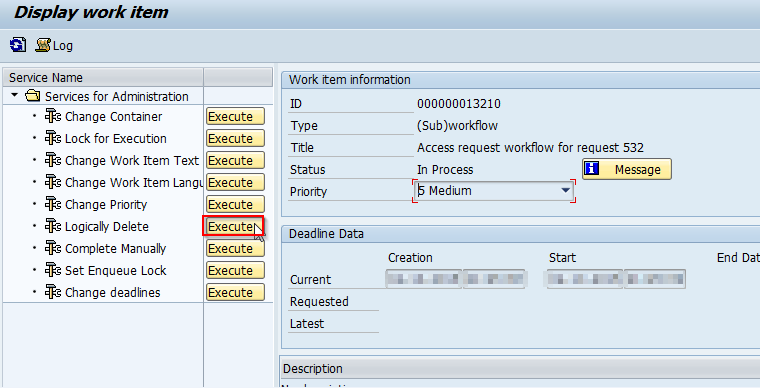 NWBC ‘Cancel Instance’ as well as program GRFNMW_MANUAL_INSTANCE_CANCEL failed to cancel the workflow instance. 2) Enter tcode SWIA, enter the latest Dialog Step ID, execute. 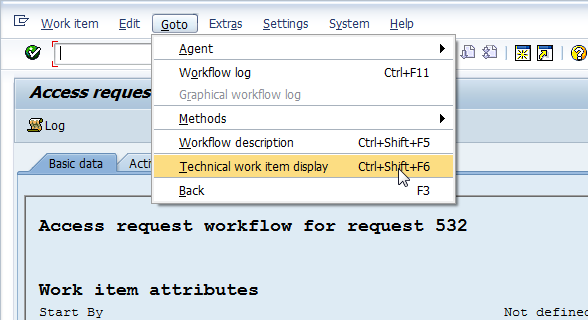 3) Click on workflow log. 4) Click on the top line item. Logical Deletion will remove the work item from the approver’s work inbox. if the instance cancel program does not work, that’s mostly because the instance is locked by another user or WF-BATCH. To release the lock, use transaction SM12 and delete the lock object. Once released, you can cancel the workflow instance with the program. Thanks for the note, Alessandro. Good to know!